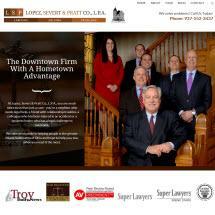 At the law firm of Lopez, Severt & Pratt Co., L.P.A., we are lawyers who solve problems. For over two decades, we have been helping clients face difficult legal issues and providing practical advice that is tailored to their specific needs. Located in Troy, Ohio, and serving clients throughout the greater Miami Valley region, our law firm prides itself on providing high-quality legal service on a personal level. We have the skill, knowledge, and tenacity typically associated with a big law firm, and the personalized, attentive and individualized approach of a boutique firm. We are the downtown firm with a hometown advantage. Criminal defense — From OVIs to drug charges to felony indictments, we offer clients a strong defense to potentially life-altering criminal charges. Family law — When you, your family or children need legal help, we’re here. From divorce to child custody, we know how to get you what you need. Personal injury — If you’ve suffered an injury due to someone else’s negligent or reckless conduct, you deserve compensation for your losses. Litigation and business — We also represent plaintiffs and defendants in civil litigation matters and frequently work with businesses that need assistance settling disputes. With over 100 years of combined experience, our attorneys understand that being responsive to our clients' needs is paramount. And this level of dedication to our clients’ needs — combined with our hard work, unyielding dedication and proven track record of success — is what has led us to be voted the best law firm by readers of the Troy Daily News every year since 2010. "Lawyers Solving Problems" isn't just our motto — it's how we practice law on a daily basis. When you have a legal problem to solve — whether it be criminal law, family law or another area of practice — we can help you, too.